The current trend offers you multiple arrays of bottom wear with everything in comfort, from athleisure track bottoms to flared pants. So why just stay in your regular old skinny pair of jeans when the stores across are calling for all those amazing pairs of pants for you to be in. What are they and how can you style them up, is what we will tell you! And how you can copy the trend the fashion bloggers are setting. Learn how to style a pair of pants and from where to shop them. 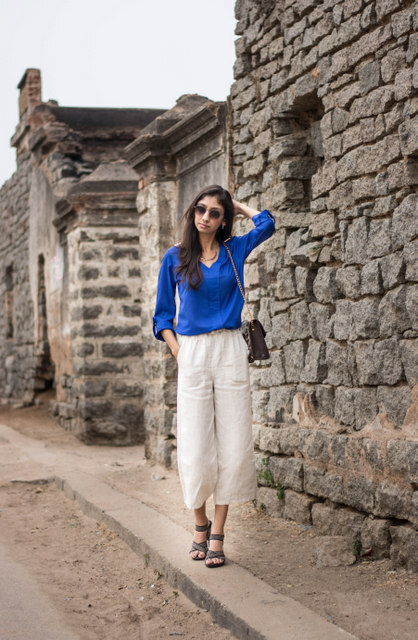 Rati Tehri Singh flaunts her chic flared pants with a nice sky blue shirt with everything on point and trendy. We like how effortlessly chic she looks strutting down her way in that comfortable pair of black pants. Sherry carries boyfriend jeans with an effortless muse! Fancy a pair of comfortable culottes? Comfy and chic with a crisp appeal, we love to pair them with a well-fitted top. Velvet made an elegant comeback this year, and we cannot just stop drooling about it. Fashion bloggers are all set and on the go to show us the much-loved velvet worn as bottom wear. Stripe is a major fashion statement when worn right, it is a major statement. Debasree Banerjee has given us some serious fashion statements. She has donned vertical and horizontal stripes with such ease. All it takes is a pinch of fashion inspiration, oodles of confidence and your pretty smile to pull off a statement outfit and there you are, all set to roll! Shop the latest and trendiest range of apparels from Shoppers Stop!